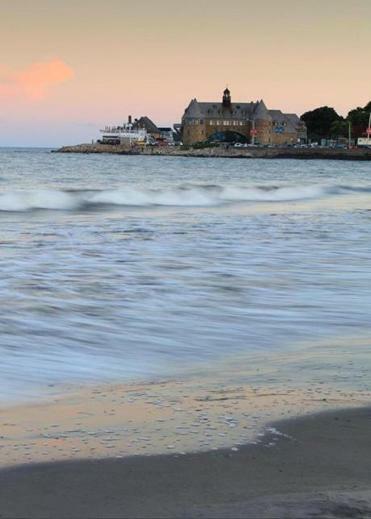 The answers were as numerous as the aforementioned clam shacks, but one little town rose to the top: Narragansett, R.I. was named best beach town in New England by Boston Globe readers. We were just as surprised as you when we tallied up the results. If you don’t agree with the winner, don’t direct your venom toward us, it was your vote. There were several towns on Cape Cod that scored high on our survey, including Dennis, which missed the top spot by a whisker (better luck next year). Ogunquit, Maine, and Provincetown were also favorites. But this year Narragansett gets the sash and tiara. The town of 16,000, which swells to 32,000 during peak season, was cited by readers not only for its prime beaches, but also its character, activities, and, of course, Aunt Carrie’s clam cakes. This town is so unique that it has a pair of 19th century towers spanning the main road downtown. “It has a small-town feel, friendly locals, iconic towers, all sorts of restaurants, good waves for surfing, beautiful sunsets and even more gorgeous sunrises,” wrote voter and Narragansett enthusiast Charlie Ashworth. “Best waves, warm water, great family atmosphere,” wrote another voter. Is Narragansett really the best beach town in New England? There was only one way to find out. It was time to take a trip. Narragansett Town Beach seemed like a logical launch pad. Even on a chilly, foggy Thursday afternoon, the water was filled with surfers. Enthusiasts travel hundreds of miles to surf, or to learn to surf here. According to the website Surf Forecast, water temperatures can reach up to 78 degrees in the summer. By way of comparison, water temperatures at Old Orchard Beach max out at a bone-chilling 68 degrees during August. It’s Steve Wright’s job to talk up Narragansett’s beaches, and he does it well. He’s the director of parks and recreation for the town. But I was honestly sold on the mile-long Town Beach before he started his pitch. The drawback is that the beach can be pricey. Admission is $10 per person (children under 11 are free). Parking is another $10 on weekdays, and $15 on weekends. One local told me that Town Beach is where you go when you want to be seen. The state-run beaches in Narragansett — Salty Brine, Roger Wheeler, and Scarborough — don’t charge by the head so they are more affordable. Lot parking is $12 on weekdays and $14 on weekends. They’re not in the center of the action, but they have top-notch facilities and beautiful sand. Each beach also has a distinct personality. Roger Wheeler is popular with families because it has a calm surf and a playground. The tiny Salty Brine beach is popular with those headed to Block Island and also with families with very young children thanks to placid, warm, and shallow water. Scarborough is the most popular beach in the state and has two pavilions, a boardwalk, an observation tower, plus sitting areas along the boardwalk. There are also picnic tables, concessions, restrooms, and coin-operated hot showers. It’s where you’ll find the majority of tourists. Poke around a bit and there are small beaches where locals go, but because I don’t want Narragansett residents to rough me up, I’m not divulging the names of those beaches here. I wish I could have reported on the buffet of delicious Narragansett beaches and then written about the hours I idled under the sun, but sadly there was no beach weather during my stay. The inclement weather gave me more time to indulge in Narragansett’s other big attraction: Eating. Durfee has clam cakes on his menu, but he’s moved the focus of his 500-seat restaurant from fried to more refined. You can also find clam cakes at Aunt Carrie’s, a 98-year-old BYOB institution. A clam cake is a deep-fried ball of dense deliciousness. Its closest relative is a fritter, not a crab cake. It’s not a dainty thing, and at Aunt Carrie’s the orders come by the half-dozen or dozen. Other essentials: Rhode Island clam chowder at George’s, and the stuffies (that’s stuffed quahogs) and fresh-out-of-the-fryolator doughboys (generous chunks of fried dough) at Iggy’s Doughboys and Chowder House. Not all food here is fried, or doughy. Readers who responded to the Globe’s favorite beach town poll also called out restaurants such as Crazy Burger Cafe & Juice Bar, Bike Stop Cafe, Spain of Narragansett, Trio, and the Coast Guard House. Some earned raves for the food, others for the view. There are also signs of culinary gentrification as well. You can get a doughnut ice cream sandwich at the Gnarly Donut. Gourmet doughnuts are the unofficial barometer of hip. You could work off your meal by taking tango lessons at the Towers, strolling along the sea wall, learning to surf, or shopping on Boon Street. But isn’t the point of a good beach vacation simply relaxing on the beach? I recommend you obtain your daily exercise by walking from your beach blanket to the concession stand at Scarborough State Beach for some Del’s frozen lemonade. The breakdown: While Rhode Island made a strong showing, only one Connecticut beach town (Mystic) made an appearance in the survey. Beach towns in Southern Maine such as York, Old Orchard Beach, and Kennebunkport were popular. Votes for South Coast Massachusetts towns were surprisingly low. Cape Cod was the most popular region. 1. Aunt Carrie’s — For the vintage atmosphere and the clam cakes. 2. Spain of Narragansett — For the sangria and the service. 3. George’s of Galilee — For the fresh seafood, the Rhode Island clam chowder, and the beach bar. 4. Coast Guard House — For the sunset view. 6. Champlin’s Seafood Deck — For the fish and chips and the view. 7. Iggy’s Doughboys & Chowder House — For the stuffies and doughboys. 8. Brickley’s Homemade Ice Cream — For the amazing selection of 45 (or more) flavors. 9. Trio — For the Bada Bing pizza. 10. Bike Stop Cafe — For the lobster fritters, the lobster mac and cheese, and the lobster pizza. 1. Go to all four beaches. 2. Learn to surf with lessons from one of the pro shops. 3. Walk the Whale Rock Trail. 4. Check out the Point Judith Light, the lighthouse built in 1816. 5. Take a Block Island day trip on the ferry. 6. Sit or stroll along the sea wall. 7. Visit the South County Museum. 8. Relax at a free Friday night concert at the gazebo or a Wednesday night movie on the beach. 9. Kayak on the Narrow River or fish at the Camp Cronin fishing area. 10. Go to all four beaches again.